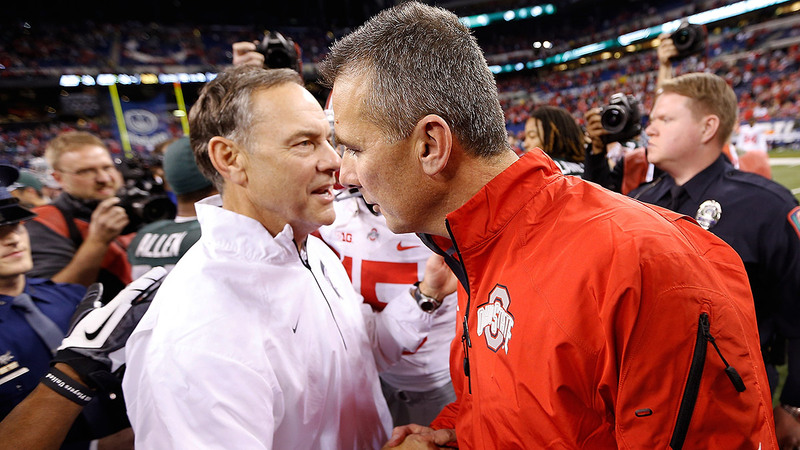 Earlier this week, Urban Meyer compared Saturday’s matchup between no. 14 Ohio State and no. 8 Michigan State to a collision between “two sledgehammers,” which is a surprisingly apt metaphor for a game that will have reverberations for the entire Big Ten. The showdown in East Lansing is a rematch of last year’s B1G championship game — a back-and-forth, 34-24 Spartans win that knocked the Buckeyes out of national championship contention and sent MSU to the Rose Bowl — and will almost certainly determine the winner of the conference’s new East Division in 2014. Both teams are 7-1 overall, and like last year, both teams arrive undefeated in league play. Within the Big Ten, Ohio State–Michigan State is the much-anticipated pinnacle of the regular season, a clash of the titans that was heralded this preseason as the conference’s game of the year, and has lived up to the billing. It is, without a doubt, the best the league has to offer. Outside of the Big Ten, though, does anyone care? For a national audience, the indisputable showcase on the B1G slate may not even be the most relevant game in its time slot, which it will share on Saturday night with equally compelling confrontations in the SEC (no. 5 Alabama at no. 16 LSU) and Big 12 (no. 7 Kansas State at no. 6 TCU) and with the first half of an important nightcap in the Pac-12 (no. 4 Oregon at no. 17 Utah). The Ducks, Crimson Tide, Horned Frogs, and Wildcats all rank ahead of Michigan State in the selection committee’s latest poll,1 leaving the Spartans needing lots of help to claim a playoff spot when the four-team field is announced next month. Ohio State, which also ranks behind fellow one-loss contenders Arizona State, Notre Dame, and Baylor, among others, has an even steeper hill to climb. Barring a wild turn of events, the Big Ten’s big winner this weekend will remain at least three rungs removed from a golden playoff ticket when the next set of rankings is released on Tuesday and dependent on upsets in other conferences down the stretch to move up the ladder. Jeff Long, chairman of the playoff committee, has insisted that his group is interested only in the particular merits of each team, not of each team’s conference. But the committee has also promised to put a premium on strength of schedule, and consider the schedules it has to compare: So far this season, the SEC has staged 11 conference games in which both teams were ranked coming in, with five more still to go (not including the SEC championship), based on the committee’s current Top 25. The Pac-12 has staged seven conference games in which both teams were ranked, with three more to play. The Big 12 has staged five, with four remaining. The Big Ten? Through 10 weeks, it’s staged one conference game in which both teams were ranked, Michigan State’s 27-22 win over then–no. 19 Nebraska on October 4. The schedule calls for one more after OSU-MSU, with now–no. 13 Nebraska scheduled to visit no. 25 Wisconsin on November 15. That’s it. The most indelible moment of the season involving a Big Ten team was a doomed coach’s decision to send his quarterback back into a game after the passer had suffered an apparent concussion. How did it come to this? Financially, the Big Ten is healthier than ever: The league reported a record $318.4 million in total revenue for the 2013 fiscal year, and is projected to grow its annual payout from roughly $27 million per school to $44.5 million after negotiating a new TV deal set to begin in 2017-18. It boasts the deepest roots and most far-flung, wealthiest alumni base of any of the major five conferences. It was the primary mover in conference realignment, dictating the terms from the outset in a shakeup that left the other top-tier leagues scrambling to keep pace and the lesser leagues scrambling for mere survival. (Not all of them made it.) As Chris Fowler has argued in the course of combating allegations of “SEC bias,” there is no more attractive prospect for ESPN’s college football business than a dominant Big Ten and a more engaged B1G fan base. Yet in the first year of college football’s playoff era, the richest and most entrenched conference in the sport resides on the margins of national relevance to such an extent that its one and only nationally impactful game of the season may be overshadowed by what counts as a routine weekend for its competitors. The situation isn’t new, but it is dire. And it’s strange. How did the Big Ten’s reputation get so toxic? And can any of the league’s contenders hope to survive it? If you look hard enough, you can probably find a few diehards still willing to argue that the Big Ten’s decline is more of a media-driven narrative than a reality — I’ll be hearing from them shortly, I’m sure — but you won’t find anyone denying that a negative perception exists. That much is inescapable. The conference’s second-class status was a prevailing theme throughout Ohio State’s two-year, 24-game winning streak in 2012-13, which didn’t include a single victory over an opponent that finished in the AP top 20.2 Before the Buckeyes’ loss to Michigan State last December rendered the question moot, the campaign was already in full swing to cancel Ohio State’s pending ticket to the BCS championship game in favor of a one-loss SEC champion, be it Auburn or Missouri, on the basis that even back-to-back undefeated seasons in the Big Ten paled in comparison to claiming the SEC crown. (Auburn’s athletic director described the notion of excluding the SEC champ, without irony, as “un-American.”) That the Big Ten has something to prove to the rest of the country is taken for granted, even within the Big Ten. Yes, and those better teams have kept on winning. From 2007 to 2013, Big Ten teams turned in losing overall records against the SEC (9-17), Pac-10/12 (17-22), and Big 12 (27-34), managing to go .500 only against the similarly marginalized ACC (11-11). Even in the context of the conference’s decline, the dearth of resonant, marquee wins in that stretch is almost startling. The Big Ten’s last regular-season win over a top-10 team — from within its ranks or without — was a little more than three years ago, on November 5, 2011, when Northwestern upset no. 9 Nebraska in Lincoln. For the last regular-season nonconference win over a top-10 team, we have to go all the way back to September 16, 2006, and Michigan’s 47-21 upset over no. 2 Notre Dame. Almost startling, but not quite, because the league’s national profile has ebbed accordingly. So far in 2014, B1G teams are 5-11 against teams from the other Power 5 conferences,3 with seven of those defeats coming by at least 14 points. The first weekend of September in particular was a universally acknowledged bloodbath, including decisive, high-profile flops by Michigan State (at Oregon) and Ohio State (against unranked Virginia Tech) that seemed to leave the league’s playoff hopes on life support barely two weeks into the season. It took Indiana, of all teams, to raise the Big Ten banner in SEC country with an inexplicable, 31-27 upset at then–no. 18 Missouri on September 20. That game sits alongside Michigan State’s win over Nebraska as the conference’s only victories over an opponent ranked anywhere in the major polls, and it remains a head-scratcher: The previous week, the Hoosiers had lost a 45-42 shootout against Bowling Green; six weeks later, they’re 0-4 in B1G play, having lost by an average margin of 25.3 points per game. Welcome to the Big Ten, circa 2014: We’re not feeling very good, but the facts are the facts. In the same interview, Delany said, “I do what I can do, which is do my job,” and as far as his job concerns managing the league’s balance sheet, he’s done it as well as any of his peers, if not better. Financially, at least, the Big Ten is feeling very good. But the evolution of a century-old alliance of like-minded universities into a fully monetized, 21st-century #brand has also alienated the core fan base, which has been asked to spend more than ever on tickets and cable bills for an increasingly watered-down product. By bringing Rutgers (New York) and Maryland (Baltimore/D.C.) into the fold, the league immediately bolstered its bargaining position with television networks desperate to reach major East Coast markets — as Maryland president Wallace Loh explained in November 2012, the driving force behind conference expansion was always the competition for “eyeballs on a screen” — seemingly without giving much thought to whether anyone in either area, or anywhere else, really cares that much about watching Rutgers or Maryland play football. For a league that was already saddled with the competitive dead weight of Illinois, Indiana, Minnesota, Purdue, and (depending on the year) Northwestern, the result has been a conference schedule that may as well have been specifically designed to keep the conference’s best teams from ever playing one another. Among the three best teams in the West Division in 2014 (Nebraska, Wisconsin, and Iowa), and the three best teams in the East (Michigan State, Ohio State, and Maryland), there are only three head-to-head dates on the entire cross-division schedule: Michigan State–Nebraska, Iowa-Maryland, and Wisconsin-Maryland. If you’re skeptical that Maryland belongs in that rotation,4 go ahead and replace the Terps with one of the sleeping giants in the East, Michigan or Penn State. The result is the same: Neither the Wolverines nor Nittany Lions have played or will play Nebraska, Wisconsin, or Iowa. Altogether, seven Big Ten teams this season have already reached the six-win barrier for bowl eligibility, more than in the Pac-12 or Big 12 and only one fewer than in the SEC. To date, though, those seven teams have combined for just two head-to-head meetings: Michigan State–Nebraska and Ohio State–Maryland. How many people were clamoring to tune in for Ohio State–Maryland, a game the Buckeyes led 31-10 at the half and went on to win by four touchdowns? How can the conference even begin to reverse its reputation for high-profile disappearances if it’s unwilling or unable to facilitate the most high-profile matchups within its own ranks? Nebraska — Nebraska, a blue-blood program that has spent 70 weeks atop the AP poll in the past half-century, and finished there four times — is in the midst of what’s shaping up to be its best season in more than a decade, and hardly anyone outside the state seems to notice or care. Why should they? The most impressive entry on the Huskers’ résumé, by far, is a 41-31 win over unranked Miami on September 20. Otherwise, the rest of the home schedule reads as follows: Florida Atlantic, McNeese State, Illinois, Rutgers, Purdue, and, for the grand finale, Minnesota. Even the fiercely loyal “Sea of Red” can’t be expected to keep shilling out for that malingerer’s row. In the face of the facts, many Big Ten fans (following Delany’s lead) have abandoned defending the conference’s on-field record, which was overrun long ago, and retreated to the higher ground, where they can take refuge in their conviction that they do things the right way — unlike those feckless, win-at-any-cost heathens in the South.5 But even that lame facade is beginning to crumble, in part because two of the most notorious college football scandals of the past decade have unfolded at Big Ten schools, Ohio State and Penn State, the latter of which forever redefined how all other college sports scandals will be measured; and in part because a school like Stanford, which condescends to the Big Ten academically, has managed sustained success in football without acquiring the whiff of a football factory.6 The notion that there’s anything morally or ethically dubious about investing in the sport — in assistant coaches’ salaries, in recruiting budgets, in facilities — doesn’t hold much water when football is solely responsible for generating such towering profits. In any event, the suggestion that righteous rhetoric takes priority over winning records is as hard to take seriously in the Big Ten as it is everywhere else. In early 2012, then-Wisconsin head coach Bret Bielema responded to Meyer’s early recruiting success at Ohio State by vaguely accusing the Buckeyes of “illegal” tactics and assuring reporters that “We at the Big Ten don’t want to be like the SEC — in any way, shape or form.” By the end of the year, Bielema had fled Madison for the top job at Arkansas, citing his inability to keep good assistants at Wisconsin due to inferior salaries.7 At the time, the Badgers were slated to play in their third consecutive Rose Bowl, while Arkansas had yet to win an SEC title in its 20 years in the league. Talent follows the money, but only when it’s spent on reinforcing more talent. Of course, neither Ohio State nor Michigan State can do anything about any of that on Saturday night. As far as they’re concerned, the game will play out against the backdrop of the short-term goals within their grasp — a conference championship, a potential playoff bid — without so much as a subliminal twinge for the league’s long-term prospects. The stakes are very high as it is, and the atmosphere in East Lansing should reflect that. Hopefully, the game will, too: If it measures up to the championship collision last December, in which the Spartans scored the game’s first 17 points and last 17 points on either side of a 24-point run by the Buckeyes, it will go down as an instant classic. Regardless of the outcome, though, from a national perspective the game exists in a kind of vacuum. Ohio State lost its only notable nonconference test to an unranked Virginia Tech team that currently occupies the basement of the ACC’s Coastal Division with a 1-4 league record. Michigan State failed its only nonconference test in decisive fashion, yielding 46 points on 491 yards of total offense to a legitimate playoff front-runner, Oregon, which left the vaunted Spartans defense looking like just another speed bump. The only other point of reference for either team’s potential against a quality opponent is MSU’s win over Nebraska, but there’s no way to gauge the value of a victory over the Cornhuskers at this point, since they’ve yet to face a quality opponent aside from the Spartans. Plus, Michigan State almost blew that victory at the end. Such are the calculations that are so often misread as “bias” in a system that is (1) based largely on drawing conclusions from indirect and frequently contradictory comparisons, and (2) ill-suited to informing said comparisons. I spent years battling the assumption that the Big Ten was gathering rust or that the SEC was pulling away, which were two sides of the same annoying argument. Both conclusions struck me as shallow, anecdotal, and dubious. Gradually, though, the perception has become such an undeniable reality that the Big Ten commissioner himself has been forced to own up to it every time his conference has gotten sand kicked in its face. Delany doesn’t even bother to describe the malaise as “cyclical” anymore. Until further notice, it’s just the way things are. It doesn’t take great teams to make a great game, but if either Michigan State or Ohio State is a great team, it’s going to have a hell of a time proving it this weekend, or in the foreseeable future. Beyond getting a decisive leg up in the conference race, the best either side can hope for on Saturday is to turn enough heads to become a viable candidate for the final four if (or when) the dominoes start to fall at the top of the other leagues. The Spartans and Buckeyes may be worthy contenders, and they may be good for an evening of high entertainment and drama. Regardless of the outcome, though, convincing the rest of the country that the winner deserves a shot at redemption in the playoff will remain a hard sell until we finally see the Big Ten’s best beat someone else’s. The first College Football Playoff ranking came out on October 28, 2014. Where applicable, this file will reference the selection committee’s polls; rankings from earlier this season or prior seasons will cite the AP poll. Two of the Buckeyes’ victims in that span, Nebraska in 2012 and Wisconsin in 2013, landed in the final poll at no. 25 and no. 22, respectively. Including two losses to Notre Dame. 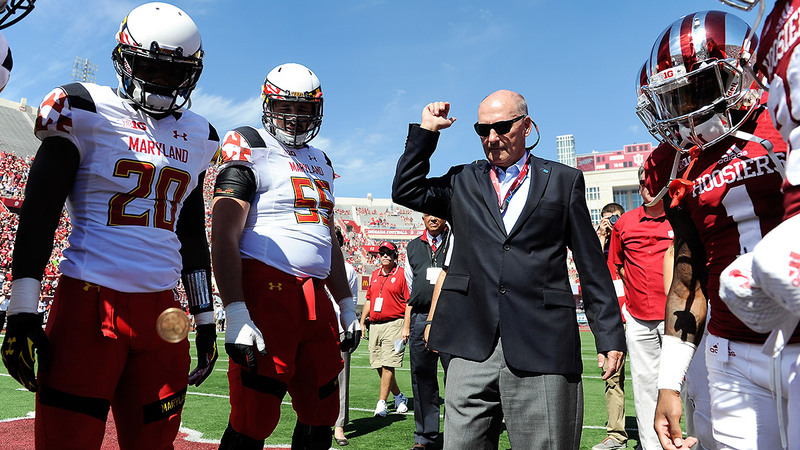 The Terps are currently 6-3 overall and 3-2 in conference play, good for third place in the East Division. Notre Dame fans also know that terrain well. And academics certainly haven’t held the Big Ten back in basketball, where it’s emerged as the nation’s premiere hoops conference. In 2013, Big Ten assistants made less on average than their counterparts in the SEC, Big 12, and ACC. What's Going On in the NHL Central?